Don’t worry I am still alive, I just took a little break from blogging as I had family visiting, lots of people to catch up with after vacation and just trying to keep busy and get my life back on track. With not having a job per se, Saying that I have many hobbies and activities and I dabble in this and that but no actual 9-5 occupation, I like to keep myself as busy as possible. If I stop being busy that’s when I get lazy and start feeling sorry for myself that I’m not busy.. That’s how I feel today so I am back in the Blog-a-sphere and typing like crazy. You with me still? So here is a run down of what I have been upto recently. It’s no secret that I am a horrendous dancer and I have never claimed to be anything better than horrendous which us why it may be shocking that I took part in a Salsa class. No, it’s not about dorritos or a tomato based sauce that goes with it, actual dancing with rhythm and stuff eeekkkk! My lovely friend/boss/suggestion maker Kate (hi Kate!) at Y magazine suggested that I take a class and write a story about it for the magazine. I am actually delighted to say that I really enjoyed the class, they were welcoming and friendly and it didn’t matter that I went without a partner – Mr Duncan was too busy drinking beer and watching the football. You can read my salsa review in this week’s Y magazine or by following this link here. Eliza and I have been saying for literally months that we wanted to go ice skating so this week we finally made it happen, yipeee! What better place to go when it is roasting outside? 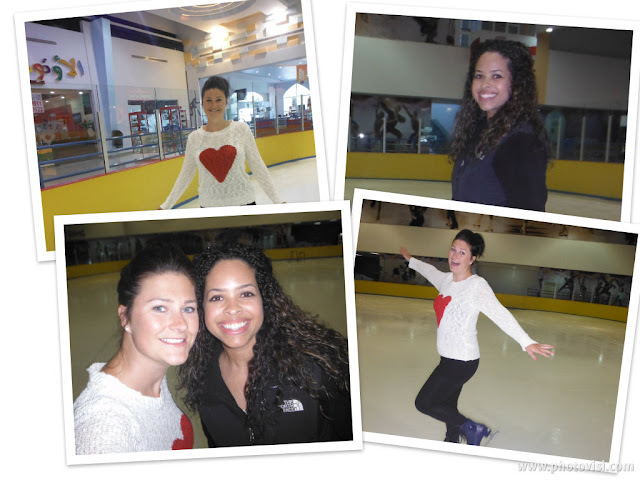 I still find it quite amusing that Muscat even has an ice rink, I would never have guessed it. It’s been a while, well actually around 5 years, since I last skated so I was pretty rusty but I managed to stay on my feet and not my arse for the entire time so that was a huge achievement for me. On Wednesday without and forward planning I got a call saying we have tickets to a concert for Taboo from The Black Eyed Peas at the Shangri La Hotel, but you’ve only got an hour to get ready ahhhhhh. I was in the supermarket buying grass seed so I rushed home to get ready. But I do say that they unexpected nights are always the best. Although it wasn’t really my kind of music, a little too house & dance for my liking, I had a great time. We danced and had a good laugh but some of that laughing was aimed at my dancing.. Peter told me I stand more like I’m at the races than a concert, Maybe for next time I need to work on being a more concert kind of gal? For a while I’ve been looking for a new place for kick boxing lessons but everywhere seemed to be a bit..well..lame.. I wanted something to challenge me and get my frustration out and Muay Thai (Thai kick boxing) seems to be just the thing for me. There is a fitness studio in Qurum called Hawk Fitness that runs kick boxing, personal training and Zumba classes. I jumped, literally, at the chance of a lesson and I wasn’t disappointed. It was physically the hardest thing I’ve ever done! After the class I was physically and mentally exhausted and felt better than I have in a long time. This will be my next hobby! Over the next few weeks I have some more adventures planned and lots of things to keep me busy. I’m sure with more assignments from Y magazine I will be having great fun along the way. I lvoe your outfit for the concert. Lady-like is always chic. BTW, where is the new skating rink? I want to go so bad? Thank you for your comment! The rink is in Qurum, I don’t think it’s new but it was the first time I had been. Think it’s called the Fun Zone? with bowling and Horizon gym etc. They even do ladies days which is so nice and relaxed. It is a new location for it, it used to be in Khuwair near Zawawi Mosque on the ministry street. It was the worst skating rink in the world.